An inexperienced observer on a lake cruise at Lake Nahuel Huapi, Argentina, only expects to see beautiful mountains, forests and the deep blue lake. Some gulls will fly beside the ship to eat the biscuits that the crew or passengers feed them with. But beyond the wind and the froth covered waves on the lake, the average tourist does not expect to see anything unusual. But, if some infrequent circumstances come together, then the tourist will see something unexpected, and will conclude that it is lake monster. On a calm day (not very frequent at most Patagonian lakes - the persistent westerly winds tend to stir up waves) when the lake is like a mirror, a swimming animal will surely attract our tourist's attention. If it is a bobbing gull or a swimming huala, it will not be a surprising event; but if the animal is a wild boar or a deer swimming in the lake, then our tourist will be startled (most tourists ignore the fact that there are boars and deer in the Andean forests at Nahuel Huapi National Park). Another animal, the guanaco, is according to Charles Darwin a good swimmer: The guanacos readily take to the water: several times at Port Valdes they were seen swimming from island to island. Guanaco are found all over Patagonia (though they are rarely seen at Lake Nahuel Huapi, they are abundant in most of the southern lakes). So, what would one of these animals look like? Huemul nadando en el lago Futalaufquen (Huemul swimming in Lake Futalafquen). Photo: Daniel Marchetti. From . Yesterday I mentioned that wild boars also swim across the lake between Huemul Peninsula and Victoria Island. 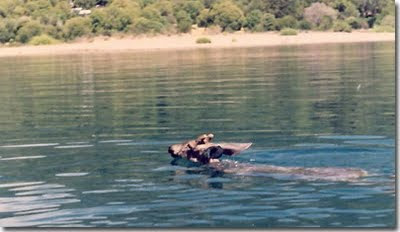 Below is a photograph of a swimming boar (not in Patagonia though. The image is just to give you an idea of what a swimming boar looks like). 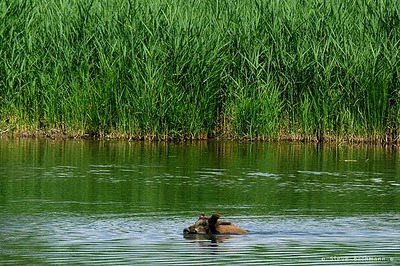 Swimming wild boar. From . If you saw a boar or a deer in the middle of a lake and did not know that these animals lived there, what would you think you saw?